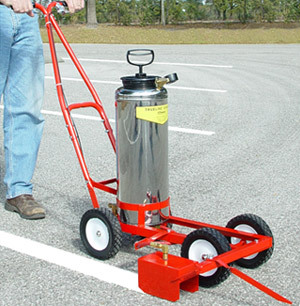 The Trueline Standard 4 gallon pump up striper is an easy to use factory floor, parking lot or field striper. 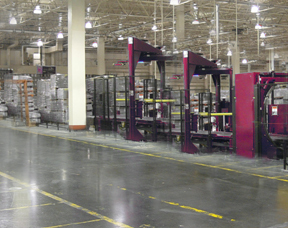 We recommend this unit to our customers who want to stripe their own factory floors or parking lots and are on a budget. 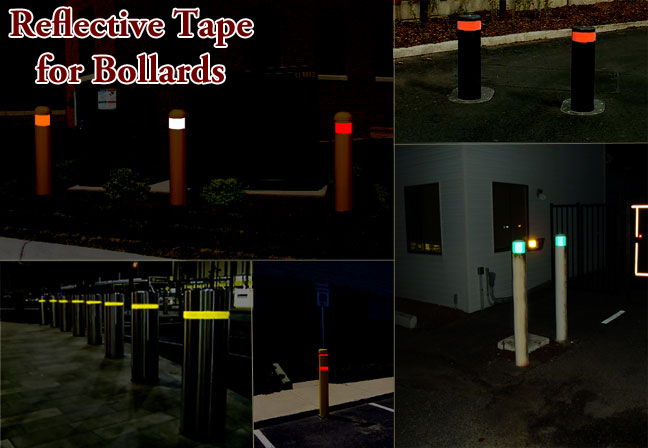 The Model 20 Paint / Parking Lot striper is very simple and virtually trouble free. The striper comes with a 4″ stripe box. To do wider lines you simply create multiple lines side by side. To use this machine you simply pour thinned paint through a strainer into the main paint tank and close the tank. Then you pump to about 45-50 psi pressure and your are ready to stripe. Just squeeze the paint lever and walk a normal speed. Units are in stock for quick delivery. Order below online or call 850-934-3157. Price – $735 plus shipping. Click below to order the standard Model 20 Pump Up machine. You can also order the “Model 20 PLUS” This model includes an air valve and a safety relief valve. 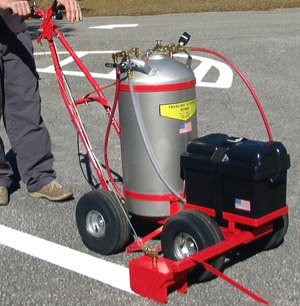 (see picture at bottom of page) This allows you to fill the machine with compressed air from an external tank or compressor. The valve is just like the one on a car or bicycle tire. This gives you the option of either pumping by hand for air pressure or using an external air source. The relief valve keeps you from over pressurizing the tank. There is a picture of the additional attachment at the bottom of this page. Price – $795 plus shipping. 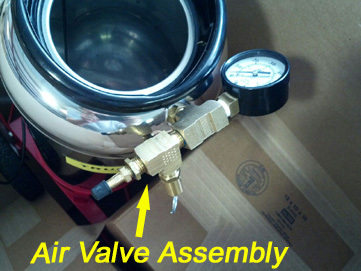 Click below to order the Model 20 PLUS with the additional air valve setup. When you buy through us you will also receive our “Stripe-Calc” parking lot striping / sealcoating pricing program plus our marketing guide as well as technical and business assistance all at no cost to you. Welded Angle Iron Steel Frame with 1/2″ solid steel axles. 8″ x 1.75″, solid rubber tires. Commercial quality Shut-off valve, spring loaded for instant control. All steel parts have a baked on powder coating. Alumininum hand control, stainless steel cable. Guide line pointer, helps you stripe a perfect straight line. 60 psi gauge to show amount of pressure in the tank. Heavy gauge steel Spray Box, fixed width for precision lines. 9″, 8 quart galvanized steel funnel with fine mesh nylon strainer bags. Viscometer to measure paint thickness. Inline check valve strainer/ made of stainless steel and brass. Catches any particles in the paint and also stops paint flow instantly at the spray tip. Brass and Stainless Steel Fittings. Comes 98% assembled. Within 30 minutes you are ready to stripe! 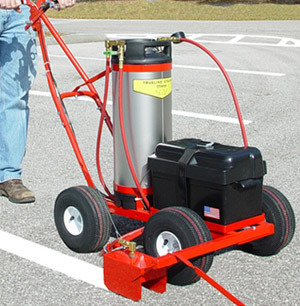 The Trueline 250 N and 350 N (nitrogen powered) 5 / 10 gallon stripers are easy to use paint stripers that can be used to stripe factory floors, parking lots or sports fields. The 250 N is a 5 gallon machine and is the more popular unit. The 350 N is the 10 gallon machine and is normally sold to companies who will be striping roads, airports or other large jobs. Both units are great for companies that have need to be able to stripe remotely where compressed air or power may not be readily available. 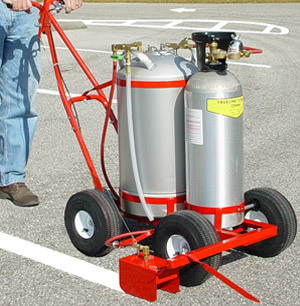 One nitrogen tank will spray up to 100 gallons of paint which is enough for about 40,000 feet of 4″ striping. We recommend this unit to our commercial striping customers who stripe for a living and may be using the machine in multiple environments. It is a very low maintenance machine with almost no moving parts to break. Units are in stock for quick delivery. Order below online or call 850-934-3157. When you buy through us you will receive our “Stripe-Calc” parking lot striping / sealcoating pricing program plus our marketing guide as well as technical and business assistance all at no cost to you. The 250 N and 350 N machines use nitrogen for pressure. There is a pressure regulator between the nitrogen tank and the paint tank. You set this regulator to the pressure you prefer and when you open the nitrogen tank valve it quickly pressurizes the paint tank and keeps it at a constant pressure. Nitrogen tanks and refills can be obtained at your local welding supply store. A refill is approximately $15. Since nitrogen is a completely neutral gas it will not dry paint or change the pH sensitive balance. It is safe and non flammable and makes up two thirds of the air we breathe. Welded Angle Iron Steel Frame with 5/8″ solid steel axles. 10″ pneumatic tires, heavy duty steel hub, steel ball bearing, load rating 100 lbs. each. Power Mixing Paddle for mixing the paint. Regulator with dual guages. One shows the amount of Pressure in the Nitrogen Cylinder and the other for operating pressure. Drain valve/hose makes clean-up a quick, clean job. Box Lift Lever assembly raises and lowers spray box. Aluminum hand control, stainless steel cable. Tank Brush to clean inside of paint tank. Parking Brake locks wheels tight in rolling terrain. Extra Spray Tips for heavier coverage and faster production. 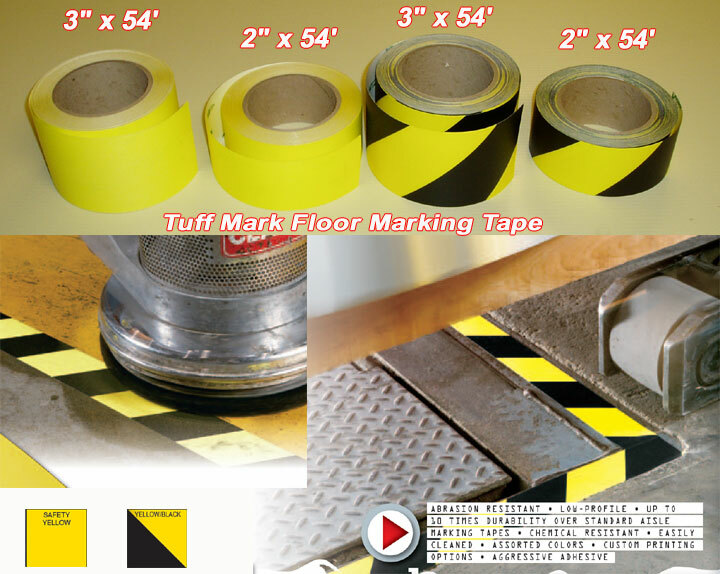 The Trueline 250 BP and 350 BP (battery powered) 5 / 10 gallon stripers are easy to use machines that can be used to stripe factory floors, parking lots or fields. The 250 is a 5 gallon machine and is the more popular unit. The 350 is the 10 gallon machine and is normally sold to companies who will be striping roads, airports or other large jobs. Both units are great for companies that have need to be able to stripe remotely where compressed air or power may not be readily available. 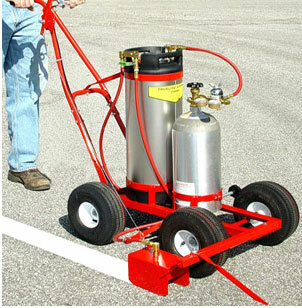 One charge on the battery will spray up to 60 gallons of paint which is enough for about 24,000 feet of 4″ striping. We recommend this unit to our commercial striping customers who stripe for a living and may be using the machine in multiple environments. It is a very low maintenance machine with very few moving parts to break. Units are in stock for quick delivery. Order below online or call 850-934-3157. Both the 250 and 350 BP have an amazing state of the art battery charging system. All you need to do is plug it in and the charging unit will automatically keep the battery topped off and will shut down automatically to prevent over charging. 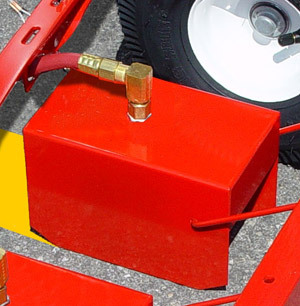 The air pump is activated by a switch near the hand grips and only needs to be activated to add pressure to the tank. The machine operates quietly when striping. When you receive the unit you will first fill the battery with 2 1/2 quarts of battery acid which you can get at an auto parts store. Then you simply charge, fill with paint and begin striping. 12 Volt Dry Cell Deep Cycle battery (needs 2 1/2 quarts of battery acid for initial charging – may be purchased locally from any automotive or motorcycle store). 10″ pneumatic tires, heavy duty steel hub, steel ball bearings, load rating 100 lbs. each. On/off switch mounted on top of handle. 160 psi gauge makes it easy to maintain a constant operating pressure while striping.